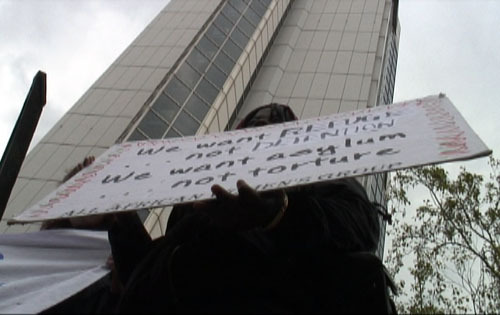 Wednesday 16 April 2008, a small protest visited private prison and immigration detention corporation, Kalyx. The protest was to draw attention to the recent incarcerated refugee hunger strikes at Harmondsworth and Yarl’s Wood Immigration Removal Centres (IRCs) over the last few weeks, that recieved no news coverage whatsoever. The Harmondsworth detainee peaceful protests and hunger strikes were broken up by riot police and 30 detainees were removed to various prisons across the country. Kalyx is a subsidary of multinational Sodexho, who operate across 70 countries, four of those with the worst human rights records in 2007. Kalyx run HMP Bronzefield, HMP Forestbank, HMP Peterborough, HMP Addiewell, Harmondsworth IRC and Prospects in Bristol. 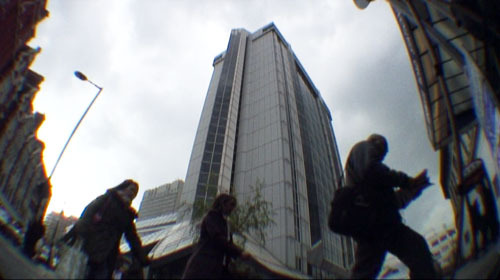 While filming another protest outside the Kalyx-Sodexho HQ in January 2007, a protest of 15 people and some 40 police officers, I was asked by one police officer not to film the building or the foyer, even from the outside, because the company was considered a major terrorist target. A little research discovered Sodexho was listed along with Haliburton subsidiary Kellogg Brown and Root as operating and providing logisitcs, catering, laundry, tent hiring, barracks management, financial advice and prison cells in Guantanamo Bay.